Speedcult has become pretty tight friends with the beer meisters over at Short's Brewing these past couple of years. Plenty of beers and roaster coaster rides have been shared over the seasons, so Short's Brewing decided it was high time to make three brews in collaboration with our equally creatively fearless crew. Short's Brewing took this collaboration even further by partnering with Speedcult to create an awesome video. Check out this Mad Max inspired collaboration with a delicious Speedcult inspired brew in hand." Speedcult Black Lager is a dark, black-colored Lager with an alluring tan lace. Enticing aromas of cocoa and burnt marshmallows lead into big flavors of chocolate in this Lager. Speedcult Black Lager’s finish is clean and dry with a slight hoppy bitterness. Fun Tina is an American Wheat Ale brewed with orange zest, lemon zest, and coriander. Golden in color and medium-bodied, Fun Tina has light and inviting aromas of wheat, coriander, and citrus. The subtle flavors of citrus and coriander combine for a refreshing beer with a clean finish. 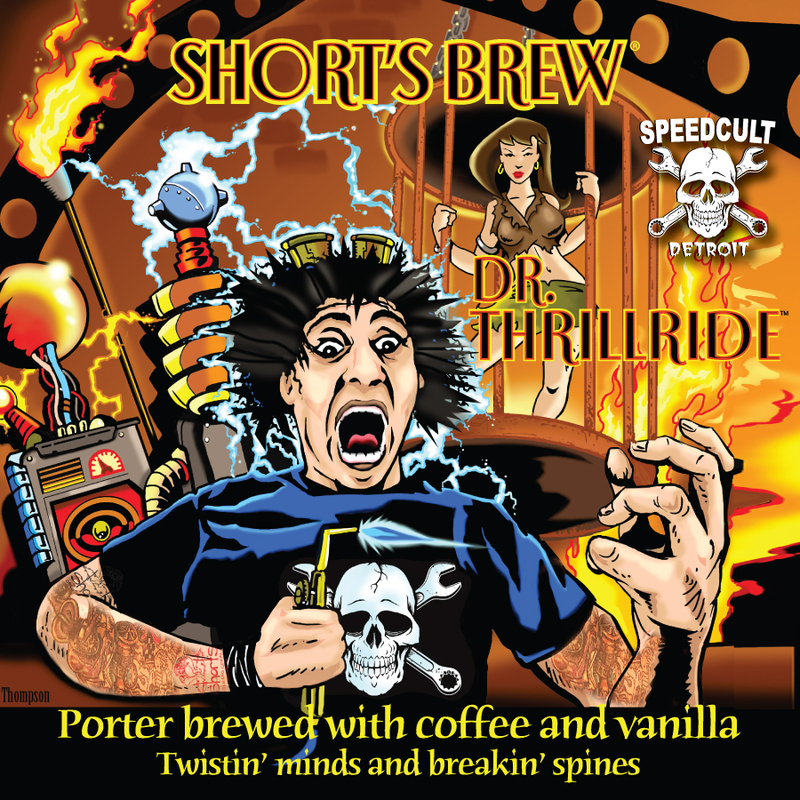 Dr. Thrillride is a Porter brewed with coffee and vanilla. This beer is a deep brown color and pours with a frothy mocha head. Well-balanced aromas and flavors of fresh coffee, chocolate, and a hint of vanilla abound from this brew. Dr. Thrillride is medium-bodied and easy drinking.